Jim Frye of Bangor closes the tie-back door on a tent that was erected Sunday, Nov. 20, 2011, and that he and others slept in overnight. He said he and other Occupy Bangor participants held a gathering at Peirce Park into the early hours of Monday morning. BANGOR, Maine — While still working to file a temporary restraining order request against the city, Occupy Bangor members attended a public workshop with city councilors and staff members Tuesday night. The workshop was called to clarify ordinances and legal language and offer a forum for both city officials and Occupy members to speak. Eight of the nine councilors were present, as was Bangor City Solicitor Norm Heitmann, City Manager Cathy Conlow, Parks and Recreation Department Director Tracy Willette and Police Chief Ron Gastia. About 18 Occupy members attended as well. Conlow opened things up by talking about the concerns city staff members have with the Occupy encampment’s permanent structures, overnight camping and failure to apply for a permit for their occupation of Peirce Park, which began Oct. 29. Heitmann then explained what constitutes a park, of which Bangor has 34, and what ordinances and policies they are governed by. He also repeated an important point about Occupy Bangor’s contention that they are holding an assembly, not an event. The situation in Bangor mirrors that in Portland, where OccupyMaine members are in talks with city officials over safety and health concerns at the movement’s 24-hour-a-day camp at Lincoln Park. Hulit, a full-time student as a double major in gender studies and philosophy at the University of Southern Maine, was attending a rally at McPherson Square in Washington, D.C., Tuesday night, but planned to be back in Portland on Saturday. 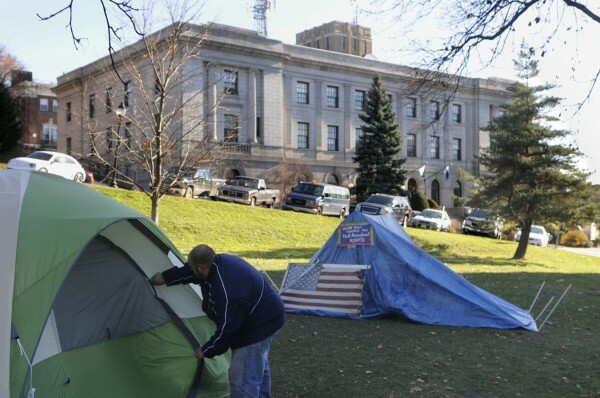 OccupyMaine has been at either Monument Square or Lincoln Park since Oct. 1. In Bangor, Councilor Charlie Longo compared Occupy movement members, who believe the nation’s financial resources and democratic processes no longer belong to the majority of citizens, to the Pilgrims who came to America to escape persecution. Law student Logan Perkins of Eddington, who works in Bangor, was the first to take the podium for the public comment section of the workshop. “We in no way meet the definition of a public event and I won’t stipulate that Occupy Bangor meets the complete definition of a public assembly either, but our activity is protected speech,” said Perkins, who was helping to work on the temporary restraining order. “The basic legal position [behind the protection order] is the parks ordinance and the events ordinance are unconstitutional as applied to Occupy Bangor” because of the First Amendment, she said. • Occupy would retain 24/7 access to a portion of the park between the Bangor Public Library’s property line up to the left edge of the Peirce statue. • Allow Occupy to remain in the park during open hours (6 a.m. to 10 p.m.) without having to fill out a permit. • Allow the group to maintain a portable toilet, which they would pay for, and a fire pit, which would be removed daily at 10 p.m.
• Allow them to maintain a finite number of political/educational signs on site. In all, nine citizens spoke before councilors offered their thoughts. Councilor Ben Sprague commended the speakers for their passion and said he’d like a better explanation for how long Occupy members plan to stay at the park. Councilor Geoffrey Gratwick said that while he sympathizes with Occupy’s ideals, he thinks councilors should uphold the law governing Bangor’s parks. “The rules we have are the rules we have to abide by,” said Councilor Jerry Durgin. Councilor Sue Hawes agreed, saying she’d like to move quickly and look at the permits process as well as the group’s four-part proposal. Mayor Cary Weston pledged to schedule another public meeting within a week or two and provide plenty of notice. Last week, Willette requested that Occupy Bangor members get an event permit by Friday and remove several makeshift structures at the site by the time the park closed Sunday night. Two of the large canopies were torn down by members over the weekend, but another one was erected in protest of the city’s request.